Although we’ve only been in existence for less than two years, Leniza managed to earn herself a Division I Rowing Scholarship to Stetson University. 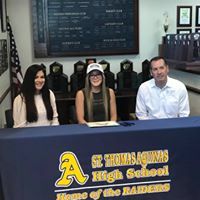 In addition to this being our team’s first scholarship, Leniza has also made history at St. Thomas Aquinas High School as she has earned their first rowing scholarship as well. Leniza was one of our hardest working athletes. She is focused, determined and wants to win. She is a founding member of our team, earned our Determination Award in 2015/16 and Oarswoman of the Year this year. She was also elected Team Captain by her teammates. We can’t say enough good things about Leniza. We will miss her and wish her much success in college!